Lon started his new job as VP of Technology at Warby Parker! They are the coolest eyewear company ever! For every pair purchased, they donate a pair to someone in need. They pride themselves on better than spectacular customer service so visit a showroom or order a free shipping home try-on kit and join the masses singing their praises. If it seems odd for me to be touting glasses on FoodMayhem, it’s because every day Lon comes home and tells me how awesome his co-workers are and all about the amazing things they do. I’m really kind of jealous. Can I have a job there too? As my first effort to “get-in” with the cool kids, I made them cupcakes using my Mini Carrot-Spiced Cupcakes recipe. 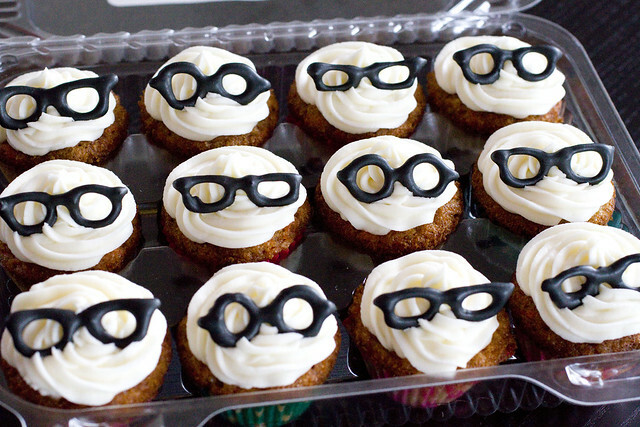 The glasses are made with royal icing. If you look closely, we did four shapes! 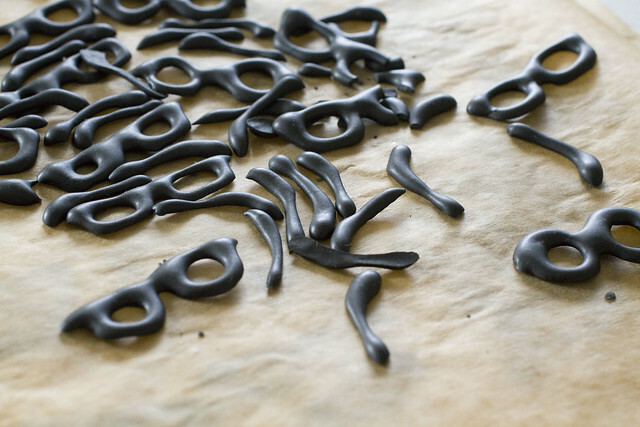 *Tip: print out any shape you want to pipe and put a piece of parchment paper on top. Then trace pipe. After the royal icing is completely dry, you can pick the pieces up and place them right on your cupcake. They are sort of brittle so make extras! 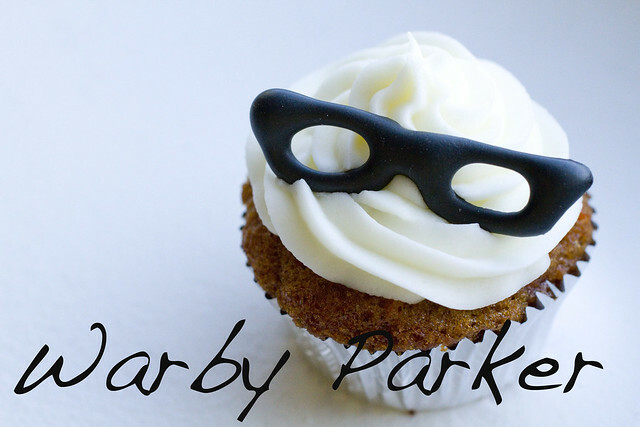 So that’s how these Warby Parker cupcakes came to be…and how you ended up getting a story about glasses on FoodMayhem. BTW, we were not paid to put up this post and they didn’t even know about the cupcakes until Lon brought them in this morning. posted by jessica	at 02:45 PM	Filed under Un-Recipes. You can follow any responses to this entry through the RSS 2.0 feed. Both comments and pings are currently closed. So adorable! I actually just learned about Warby Parker a couple weeks ago from a friend. The concept is genius, really. Looking forward to getting both glasses and sunglasses from them! Thanks Diana! We’re very proud to be affiliated with Warby Parker!